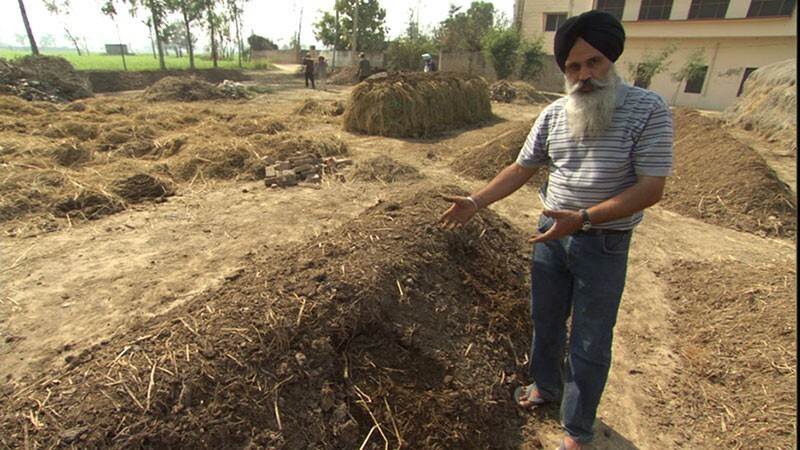 EARTH'S FOUNDATION Jaspal Singh Chattha shows off his impressive compost pile. If organic farming is merely a trend, it'll be the last one. Deborah Koons Garcia's long, lyrical documentary Symphony of the Soil makes its case for blending old farming methods with a systematic analysis of the biology of the topsoil. The film serves as a celebration of those who like to dig up the earth with their hands, crumble it and hold it to their nose, inhaling its fragrance as if it were perfume from France. "Chocolate cake," says John Williams of Frog's Leap Winery in Rutherford, describing the richness of the land he's nourished with cover-crops of peas, vetches and composted grape pomace. Koons and her crew clearly did a lot of traveling for this info-packed film. Here are farmers from Burlington, Vt., as well as Star Route Farms in Bolinas. Warren Weber, of the oldest certified organic farm in California, describes being told that California was far too arid to permit organic farming. The filmmakers visit the cradle of the revival of organic farming, the Rodale Institute, outside Allentown, Penn. At Rodale, it's explained that returning organic nutrients to the land not only improves yields but also uses less water than conventional farming. In India, Jaspal Singh Chattha demonstrates his own organic farm, nursed back to health with compost and biodynamic methods. Interviews abound, naturally. Soil biologist Dr. Elaine Ingham's drawling, analogy-rich explanations are the standout here, as when she describes the amount of bacteria in healthy soil as "Times Square on New Year's Eve." Instead of a doomsayer's prophecy, Symphony of the Soil is upbeat in celebrating the beauty of a hill of cranberry beans, the generosity of a sunflower's gift of seeds and the great importance of dung beetles versus the lesser significance of a few celebrities I could name. Likewise, the farmers here aren't deluding themselves with pride or smugness; they have the awe of people who have witnessed the miraculous recovery of seemingly played-out land. 'Symphony of the Soil' opens next Friday, Sept. 27, at the Rafael Film Center.